via Universiti Sains Malaysia, 03 February 2019: A short video of Prof Mokhtar Saidin from the Centre for Global Archaeological Research showing the Chief Minister of Penang the finds from Fort Cornwallis. A hand axe found in Perak, peninsular Malaysia has been dated to 1.83 million years, making it the oldest stone tool discovered in the part of the world. More significantly, this find also raises some serious questions about the out-of-Africa hypothesis of human origin. The oldest modern man in Southeast Asia is dated to around 50-60,000 years ago, and the oldest hominid fossil, Java Man (homo erectus) is placed betweenÂ 1 and 1.7Â million years ago. It’s been all over the news this weekend, and I’m sorry for not posting this up sooner especially seeing how I am at the said Centre for Archaeological Research in Universiti Sains Malaysia (I’ve been away to celebrate the Chinese Lunar New Year). The soil in which the tools were discovered in were dated by fission-track dating, but they do have a wide margin of error of about 600,000 years. At this stage, the results haven’t been independently verified. 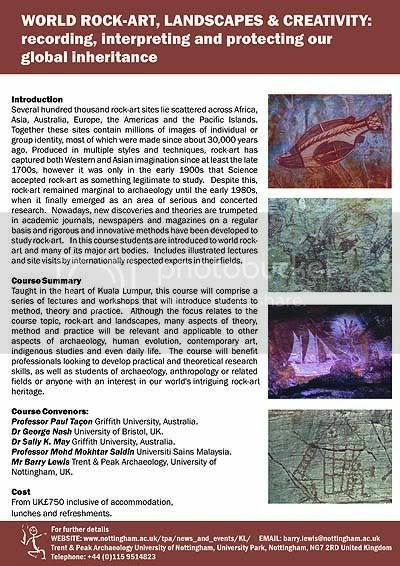 The Malaysian campus of the University of Nottingham is offering a four-day workshop on rock art in the Kuala Lumpur. Click on the image to download a brochure. 21 April 2007 (Bernama) – Archaeological research in Bukit Tengkorak, Sabah, on a prehistoric ceramics manufacturing site is set to continue, to unravel more answers on the migration and dispersal routes from island Southeast Asia to the pacific islands. The Culture, Arts and Heritage Ministry will allocate sufficient funds to enable the archeological research in Bukit Tengkorak to continue. The National Heritage Department, meanwhile, will fully finance the repair of public facilities in the area for visitors’ comfort. Minister Datuk Seri Dr Rais Yatim told reporters this when visiting Bukit Tengkorak, about 10km from Semporna town, today. The archeological research in Bukit Tengkorak, located about 500ft above sea level, and its surrounding areas began in 1994 by a team from the Malaysian Archeological Research Centre of Universiti Sains Malaysia (USM) in cooperation with the Sabah Museum Department. The research shows that Bukit Tengkorak was probably the biggest porcelain manufacturing site in Southeast Asia, especially during the Neolithic age. Over five million pieces of ceramic wares with various patterns, aged about 3,000 years, have been found there.